4. WHAT IS A FISHERIES SUBSIDY? After having thought through the overall organization of the work and drawn up a general plan for the task ahead of us, the next thing we have to do when starting a fisheries subsidies study is to define what we mean by a fisheries subsidy. To most of us, a subsidy is some kind of government support - mostly of a monetary nature - to the private sector, generally serving a public purpose. Looking up the term subsidy in a dictionary gives us that a subsidy is a direct or indirect payment, economic concession, or privilege granted by a government to private firms, households, or other governmental units in order to promote a public objective (FAO Fisheries Glossary and Encyclopaedia Britannica 2001). Based on this general notion, the Guide proposes a broad definition of fisheries subsidies according to which a subsidy could fundamentally be any government intervention - or lack of intervention - that affects the fisheries industry and that has an economic value. This economic value is interpreted as something having an impact on the profitability of the fisheries industry. 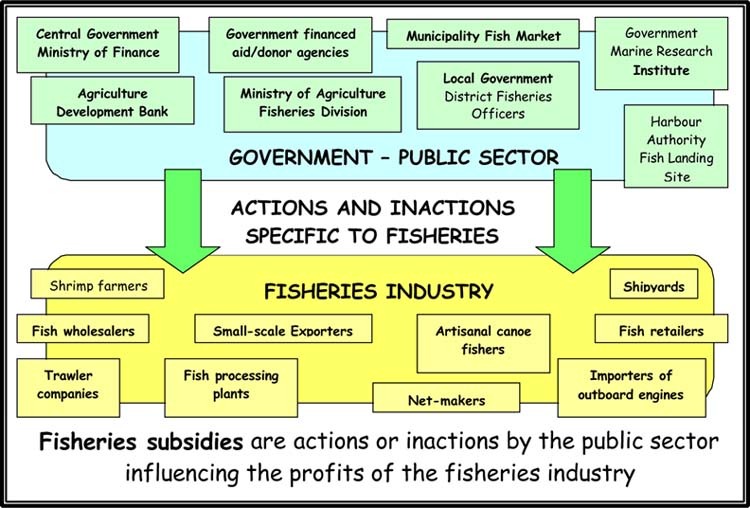 The intra-government aspect from the definition above is disregarded and subsidies are defined as actions or inactions for which the recipient is part of the private fisheries industry (and not other government units). However, not everything the public sector does or does not do can be classified as subsidies and a further qualification of the definition is needed with regard to reference points. It should be noted that the definition of subsidies used in this Guide is much broader than the one used in the World Trade Organization (WTO) Agreement on Subsidies and Countervailing Measures (SCM) which is perhaps the most commonly cited and practically applied subsidy definition. The SCM Agreement is WTOs basic subsidy agreement and the one that currently governs trade disputes regarding the fisheries sector in this respect. It specifies that a subsidy exists if there is a financial contribution by a government or any public body within the territory of a Member and this contribution fulfils certain specified conditions, or if there is any form of income or price support in the sense of Article XVI of GATT 1994. Moreover, benefits have to be conferred. For the subsidy to be offending, it also has to be specific, prohibited or actionable and cause adverse effect (WTO 1994 Agreement on Subsidies and Countervailing Measures, article 1, also described in Milazzo 1998). Government here also includes other governments and public bodies than the ones in the country where the subsidy as such exists. This would, for example, include contributions from public and international development aid and cooperation institutions. It also of course includes actions or inactions by non-fishery government agencies and organizations. If these actions or inactions benefit the fisheries industry in a significant way, they may be fisheries subsidies even if they are not only directed to the sector. Sponsorships by private companies do however not constitute subsidies. The fisheries industry refers to all productive subsectors of the fisheries and aquaculture sector, i.e. all types of input industry - including transport and other support services - capture fisheries, aquaculture, processing and marketing. It covers all producers and operators, both small and large-scale, engaged in recreational, subsistence and commercial activities. For our particular study, we may of course have decided that we only want to look at one or a few subsectors (see chapter 3). By potential profits the overall profitability of the industry is implied. While subsidies affect profits in the short, medium and long-term, the Guides focus is on the more direct shorter-term financial effects as we will see when discussing how to assess subsidies in chapter 6. It should be noted that subsidies can also negative, i.e. decreasing profits. Examples of negative subsidies would be taxes and other fees and duties. When we say that a fisheries subsidy is an action or inaction that is specific to the fisheries sector, we need to know what we mean by specific in order to be able to distinguish between subsidies and non-specific - or general - actions and inactions. The best way to do this is to define what is general and use this situation as the benchmark for normality against which specificity is measured, i.e. anything that is different from our normality reference point is specific and hence a subsidy. It is conceivable that sometime in the future countries agree on what is normal and therefore useful as benchmarks. Such benchmarks could inter alia include: interest rates for investment loans, standard fuel prices, and minimum levels of cost recovery for fisheries management, etc. However, because such standards do not exist and because it will take time to reach agreement about them the Guide suggests - for now - using standards represented by the overall economic framework of the particular country - or region - under study. The reference points to be used should refer to other sectors in the country, or group of countries, i.e. the normal situation without subsides is represented by the circumstances industry in general operates under in the country or region and fisheries subsidies are defined and measured as deviations from these conditions. For example, in a country where public services are provided so to say free of user charge - because they are financed through the tax system - it would be considered normal that also the fisheries industry benefits from certain services without them being defined as subsidies. On the other hand, in a country where cost recovery is the norm, the same benefits to the fisheries sector are subsidies if not directly paid for by the industry. It is hence up to the user of this guide to define what should be considered subsidies in his/her particular context, based on the specificity of the economy concerned and its policy framework. A fisheries subsidy is a government action or inaction that is specific to the fisheries sector, as defined within a given economic policy context. Accordingly, fisheries subsidies may be different in different economic policy contexts. In order to be able to identify fisheries subsidies according to the above definition, we need a good understanding of the overall economic framework in the country we are studying. We also need to know about the fisheries sector so that we can compare the conditions under which the fisheries industry operates with the situation of the industry in general. Quantitative information on several economic and financial issues is also needed for assessing the value of the subsidies, something that is discussed in chapters 6 and 7 below. We need to understand the overall political framework with regard to the role of the public sector. What is the general policy with regard to cost recovery of public services? What government market interventions are there? What is the role of state-owned enterprises? Are there support programmes for businesses, e.g. for regional development, infant industry, etc.? We should also look into more specific policy and legal matters, particularly in areas that are likely to be relevant to the fisheries sector, e.g. environmental policies and general pollution control measures, food safety and sanitation standards, labour and employment laws, and practices with regard to user right policies in the natural resources sector. Information on commercial interest rates is needed for determining whether the fisheries industry benefits from loans on favourable terms and for assessing other possible subsidies related to investments. As far as possible, the real alternative financial cost should be used as the benchmark and where different commercial interest rates are used for different types of investment - usually according to the perception of risk - care should be taken to use the rate corresponding to the particular situation. The baseline survey may hence need to list different commercial rates. It should be noted that this might mean including usury rates in an informal market if this is the factual market alternative. If information on commercial rates is lacking, an appropriately adjusted inter-bank offered rate or the rate of return for government bonds might serve as useful guidance. Information on other general loan and credit conditions, such as the need for collateral or typical amortization periods, could also be included in the baseline survey, as well as information on monetary policies of importance with regard to the credit system. Information on the overall public revenue and tax system that might be relevant includes VAT rates, for different goods and services if differentiated, and corporate tax rates including general rules for, among other things, depreciation allowances for fixed assets and tax deference possibilities. With regard to employment and labour costs, the main features of the tax systems for individuals need to be covered as well as the general social security structure, including rules for obligatory contributions and common benefits. Tariff and non-tariff border measures should be looked into, giving details on differences between different types of goods and services. Border restrictions with regard to direct investments, ownership or the exertion of certain professions or commercial activities also need to be considered as well as regulations with regard to immigration and labour movements. We need to know if there are any capital movement or foreign currency restrictions, especially if they apply in different ways to different sectors of the economy. Official and unofficial exchange rates of importance to the business community should also be looked at. Sometimes it is difficult to define the norm value and there may be several alternative benchmarks. For example, there may be a wide range of customs tariffs for different types of products making it virtually impossible to decide what is the normal level. In this case, we may decide to compare the fisheries sector with one or a few other major economic sectors that are similar to the fisheries sector. With regard to the example of customs tariffs, the norm value used for fish and fishery products could be the tariff level applicable to food and agricultural commodities. Another example concerns taxes for which the situation of small independent artisanal fishers, aquaculturists and traders/processors could be compared with small-scale farmers while larger fishing, aquaculture and processing companies are maybe better compared with light manufacturing industry and other food processing industry. In many (developing) countries, the former belongs to the informal sector whilst the larger operations are part of a more organized business structure, operating under quite different conditions (for example with regard to VAT registration and refund). Public market interventions in the fisheries sector, e.g. price policies, state-owned enterprises, support programmes, etc. The bullet points in chapter 4.3 above cover a large number of different types of information needed for the fisheries subsidies study. Depending on the competences and positions of the people in the team carrying out the study, some of this information may be easy to find, e.g. in a ministry or department of fisheries, information on fisheries management regimes is likely to be readily available. General information on issues that we already know something about, for example, regarding economic policies or tax regulations, may also be quite straightforward to get. In the same way, some subsidies may be easy to identify. Certain support schemes, e.g. an investment grant scheme, may be commonly known and therefore not difficult to investigate. However, there are other issues that may be outside our normal work area or field of competence. There may even be aspects that we do not know about at all and consequently a risk that certain subsidies are not discovered. Therefore, we need to consult a wide range of information sources. To ensure to the extent possible that all subsidies are identified, it is suggested that we approach the exploration of subsidies from two angles, i.e. from the point of view of the provider and from the point of view of the recipients. All government agencies and organizations that are involved in the fisheries sector and that may provide subsides - in one form or another - to the sector. The relevant bodies may be fisheries specific agencies - such as a fisheries ministry or department - or non-fisheries, e.g. a research institute or a health authority. There may also be international organizations, or foreign donor governments. Semi-public and interest groups in the form of, for example, trade unions or producer organizations, should also be identified. They are likely to provide support to the industry that they in their turn receive public funding for. The actors in the fisheries industry who receive or benefit from fisheries subsidies. These are the companies and individual operators that are active in fishing, aquaculture, production of inputs, processing, marketing and trade, etc. Making an inventory of the economic activities of the sector and listing main groups of companies and operators according to subsector, size, business form, etc., will give a good picture of the organization of the fisheries industry and help us identify who should be consulted in the process of identifying and assessing fisheries subsidies. Accordingly, it is recommended that we carry out an in-depth institutional survey as well as a thorough review of the fisheries industry. The latter is further discussed in chapter 7. Once we have identified all the stakeholders i.e. all parties involved or concerned with the fisheries sector, and we also have a fairly clear idea of what information we need, we can start collecting information and identifying the relevant subsidies. The information gathering can take many different forms - review of existing documents and reports, questionnaires, interviews, discussions, telephone calls, enquires by letter, etc. - and methodologies suitable for each particular situation have to be adopted. We may occasionally also want to consult people outside our group of stakeholders, i.e. companies or representatives of professionals in economic sectors outside fisheries, to clarify benchmarks and reference points. The extent of the data collection and the depth of analysis will depend on the objectives of our particular study and the terms of reference that we have given it. It is likely that we want to investigate far beyond a simple listing of existing fisheries subsidies and the subsequent chapters of this Guide suggest and discuss various types of analyses. However, whatever the level of detail we have agreed on for our study, it is generally a good idea to draw up a list early on of already identified subsidies and of situations and support measures that could potentially be defined as subsidies once we have investigated them further. This working document could also contain short descriptions of the subsidies, and information on the responsible authority (provider) and the recipients, and will - when finalized - provide a summary overview of the subsidies in the fisheries sector. Lower tax on fuel for fishing vessels (reimbursement retroactively). For clarity, it should be mentioned that the Guide generally uses the term subsidies, meaning - as defined above - all government actions and inactions. Occasionally, the term support measure or program is used as a synonym. With regard to government costs (revenues) for subsidies, expressions like public expenditures, expenses or costs, and public budget implications are used meaning the same thing unless stated otherwise. Likewise, the fisheries industry is sometimes called the private sector or referred to as fisheries operators, companies or firms. On those occasions when the results of the subsidy study are to be used in an investigation of the effects of subsidies on international trade in fish and fish products, the analysts will need to adapt the study according to the definition of subsidies that is contained in the WTO agreement on Subsidies and Countervailing Measures.